How far will you go to score points? Players take turns scoring or flipping over cards, looking to increase their points. Turn over the wrong cards and you will be out of the round. The last player in the round is forced to play Double or Nothing which can lead to mega-points or nothing at all. Once the seventh bonus card is turned over the game ends and the person with the most points wins. 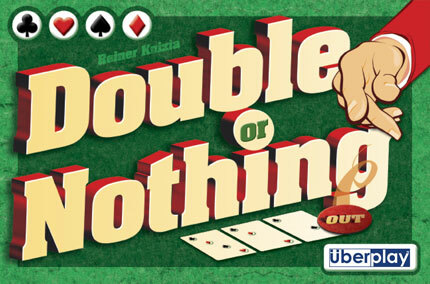 Double or Nothing, designed by Reiner Knizia and published by Uberplay, is a very simple push-your-luck game. For three to six players, ages 10 and up, the game can be played in about 20 minutes. My guess is Uberplay was hoping this game would catch the attention of non-gamers and card players. If so, I think they succeeded by providing a quick diversion that keeps everyone involved. The game is extremely simple to learn. Make sure one or two experienced players get a turn before the newbies take theirs and everyone can learn how to play just by watching. Knizia, being a man of numbers, can always be trusted to make some tricky decisions based on probabilities. So, the simple rules and tense decisions will likely appeal to a wide range of players, at least for a few times through the game. On most turns a player is presented with the choice of staying in the round, by turning over one more card, or dropping out and taking the points that are currently available. Turning over one more card could spell disaster, though, as some cards donâ€™t increase the points for the round. When a player finds this to be the case, heâ€™s out of the round with no points at all. Where does the â€œdouble or nothingâ€� come in? Well, the last player whoâ€™s still in the round has no choice but to reveal two cards. If they both add to the score for the round he gets double that amount. This can really put a player out front or at least bring him up to where he has a chance to win. Of course, if either of those cards donâ€™t add to the score, the player gets nothing. Games like this arenâ€™t new, of course, but rest assured that Knizia added a couple twists. Bonus cards might add big points, but they also increase the risk of getting nothing when they show up. Best of all, players get three cards dealt at the start of the game. At any point when you have to play a card, you can always play one from your hand if youâ€™re not too sure the luck of the draw will bend in your favor. Do I have any complaints? Well, the graphics are familiar (utilizing the familiar four suits of a standard deck), but theyâ€™re quite dull. Also, the cards are extremely thin. Iâ€™d be curious to know the production story behind this one, since this is not the usual fare for Uberplay. All things considered, I like Double or Nothing and the people Iâ€™ve played it with have had fun. It plays very quickly and casual or non-gamers can learn it easily. I suspect Iâ€™ll play it with many different groups, especially with the folks I meet at our regular coffee shop game days. Time will tell if any group plays it for an extended amount of time, which I have to say would surprise me. So, for now, letâ€™s just say this one is simple, good fun, at least for awhile. A very simple push-your-luck game that nicely builds tension as you flip each card. I'm more of a All-or-Nothing player, so I tend to win by a lot or lose by a lot, but I have fun either way.